This figure compares the displacement velocity during the last month of measurements (green arrows) to the displacement speed during all of the period, i.e. from 21 Sept. 2014 to 19 April 2015 (blue arrows). The purpose of this comparison is to monitor velocity changes in displacements towards Bárðarbunga caldera. 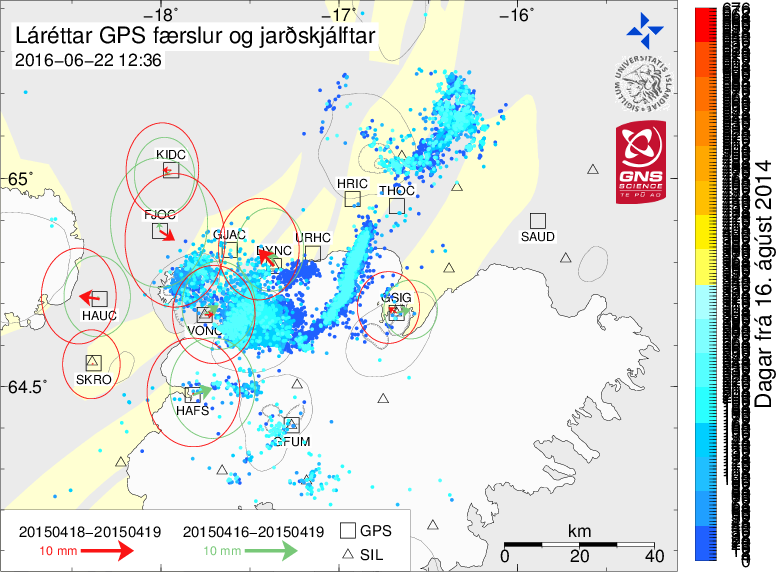 The date 21 Sept. was chosen because by then, displacements caused by the propagation of the dyke had become negligible, and from then on the displacement signals from stations around Bárðarbunga can be directly linked to the subsidence of the caldera. Monitoring ceased 19 April 2015. Enlarge. The dates are explained below. Terms, see bottom of page. Dates (yyyymmdd-yyyymmdd) above the cm/year legend. As an example, 20141213-20150113 represents displacement velocities from 13 Dec. 2014 until 13 Jan. 2015. Updated daily. This image shows earthquakes and horizontal GPS-displacements together on one picture. The earthquakes have different colours representing how long it's been since the earthquake was measured. The GPS displacements are shown over two periods: The red arrows show displacements from yesterday and the green arrows show displacement over the past three days. The circles around the arrows represent uncertainty in the measurements. Enlarge the image. Terms, see below. The dates of measurements (yyyymmdd-yyyymmdd) can be seen above the mm legend, below left. For example, 20140826-20140827 represents displacements measured on August 26th 2014. This map is updated daily. To view the change with time, see all maps and click on "keyra". The image shows earthquakes and GPS-displacements together in one picture. The earthquakes have different colours representing how long it's been since they were measured. GPS displacements are shown with black arrows. The circles around the arrows represent uncertainty in the measurements. Click here to enlarge the image. The period of the measurements (yyyymmdd-yyyymmdd) can be seen above the legend. The first station started 14 August but the newest 29 August, see a table of start-dates of each station. Total displacements are measured from each station's starting date. 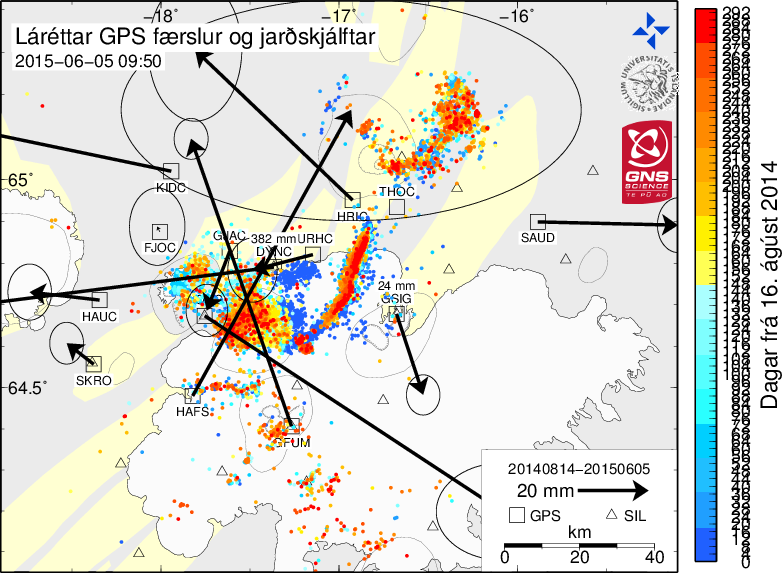 GPS displacements presented on this site are from preliminary analysis of data recorded by the Icelandic Meteorological Office and other institutions. Displacements may change upon further analysis and review. For any significant use of this data, please contact IMO and IES. This data should be clearly referenced as: "Preliminary analysed data by the GPS monitoring group of the Icelandic Meteorological Office, the Institute of Earth Sciences University of Iceland and GNS Science." Date of delivery from the data bank must follow. Further information on usage of data from IMO's web-site is given under pages about IMO.